Hidden Valley Springs is located in Calauan, on the outskirts of San Pablo, Laguna, and is an inland resort nestled in the foothills to the east of the famous Mt. Makiling, and to the west of Mt. Banahao, two mountains rich in local folklore. Hidden Valley Springs is a private resort, and is a fully maintained and landscaped and is arguably, one of the best inland resorts not just in Laguna province, but the whole of the Philippines. I have only done a day trip here so I can’t vouch for the quality of the accommodation, but based on the rest of the resort, I would say it’s top notch. Apparently, according to local folklore, the waters here have special healing powers due to the nearby volcanic presence of Mt. Makiling. As such, you often find a lot of elderly people here dipping in the springs in the hope of reversing old age ailments and other afflictions. The resort contains about three or four landscaped natural springs. 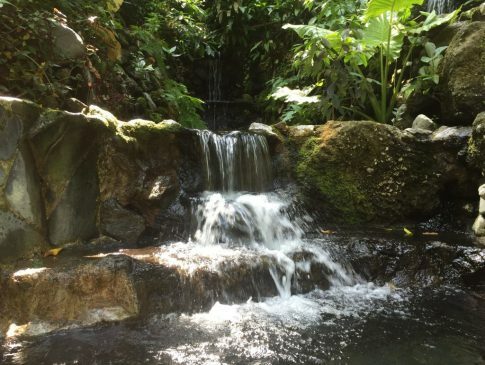 Some are multi-tiered with mini waterfalls and water flowing through them, and others that are stagnate. Towards the back corner of the resort, there is a natural hidden waterfall. This is about ten metres high and flows into a nearby river in a small gorge. To get there, there is a network of bamboo bridges. These allow for an easy walk, crossing over the rocks and foliage below. The walk to the waterfall takes about 30-40 minutes. Sprawling across ten hectares, the natural surrounds are absolutely amazing. It’s a real credit to the designers of the resort who have managed to preserve as much of the natural habitat as possible. There are still plenty of towering hundred years old trees, elegant ferns, flowering trees and plants, and hundreds of palm trees, creating a relaxing, tropical atmosphere. 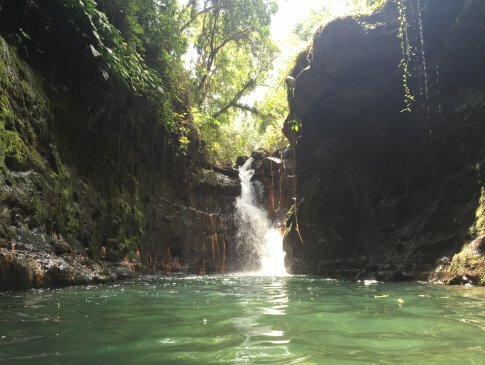 Hidden Valley Springs really is an ideal day trip from Manila. There is no vigorous hiking, and the resort is very easy to get around with ample signage directing you to the various rock pools and waterfalls. There is a restaurant there, picnic areas, gazebos, camping areas, function rooms, toilets and change rooms and if you wanted to stay the night, there are some delightful looking cottages. Entrance fee for a day tour is P2,250 (at time of writing). The entrance fee for a day tour includes a buffet lunch and afternoon tea, and use of the entire facility and amenities. There are showers and change rooms available also. This is an example of one of the cottages available at Hidden Valley Springs and the surrounding view. 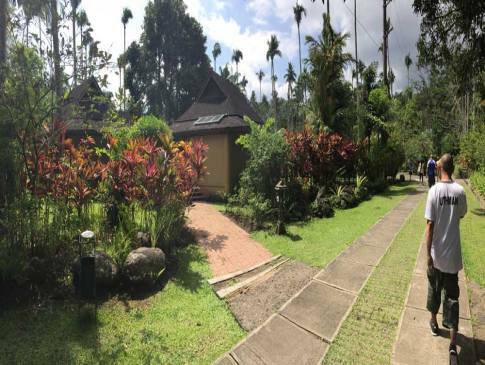 A very peaceful and tranquil setting and a great place for families or a romantic getaway from Manila. 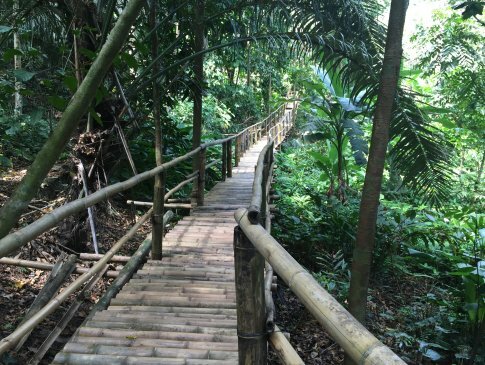 One of the bamboo bridges leading you to the natural hidden waterfall. The tranquillity of the surroundings is unrivalled, with some beautifully landscaped areas capturing the natural beauty of the place. The one natural waterfall at Hidden Valley Springs. Due to the nature of the rock formation at the basin, the current takes on a fascinating whirlpool type effect which can make it challenging when trying to swim up to the foot of the falls. One of the springs, which has been wonderfully landscaped, making best use of the natural water flow and beautiful surroundings. This is some of the cleanest and freshest water you will ever experience. It’s amazing how they have been able to make full use of the natural water flow to create a beautiful mini waterfall. The water is pure mountain water and is so refreshing to swim in. I can see why the local legend says that the water has healing powers. It certainly rejuvenated me! Another one of the landscaped springs which have been made into a multi-tiered swimming pool. It is so relaxing standing below the mini-falls, letting the water flow down onto your head and shoulders. We spent about two hours in this pool and ended up with hands and feet resembling prunes. Please click below to watch my video on the beautiful Hidden Valley Springs. Hidden Valley Springs is about 80kms from Makati and is about a two hour drive via SLEX and R3 highway. There are signs on the R3 highway at Alaminos for the turn off, but you need to look out carefully. There is a 7 Eleven and a Mercury Drug Store just near the turn off. From Buendia in Makati or Pasay Terminal, you can take a bus bound for Lucena. There are signs on the R3 highway at Alaminos for the turn off, but you need to look out carefully. There is a 7 Eleven and a Mercury Drug Store just near the turn off. From there you need to go to the local market and look for the Apasan Terminal in which you then take a tricycle. The ride to Hidden Valley Springs is about 5kms and the cost is less than P100 per person. 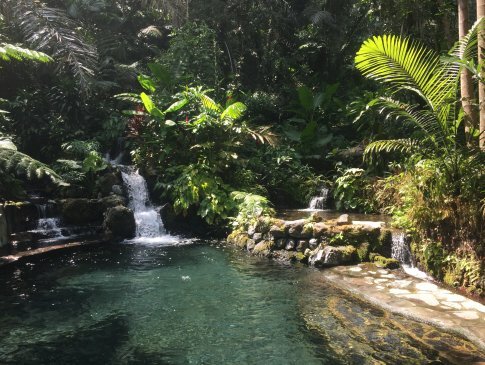 Bring some swimming gear as you would be crazy to not partake of the beautiful, refreshing waters in the natural springs and falls. 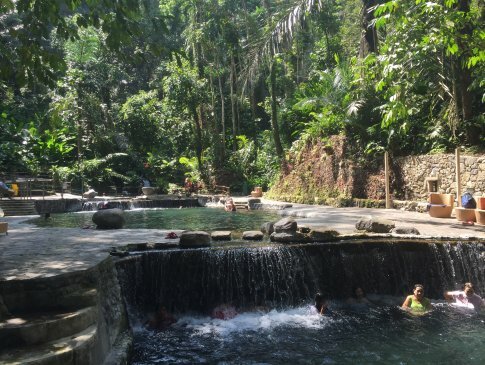 Hidden Valley Springs can easily be done as a day trip from Manila and is well worth the visit.